Berlin wall display at Potsdamer Platz. Berlin is fast reclaiming its right as a great european destination rated third behind London and Paris in visitor numbers, people are been attracted by the history, the Uber cool chique of a city with an edge, brought about by such a turbulent history that still lingers like an echo everywhere you go. Old and the new, pre and post war, east and west; like the line that the Berlin wall followed in every Berliners life is dissected from so many angles. Obvious divisions still exist between east and west berlin, and neighbourhoods can change quickly on the whims of fashion. Graffiti is rampant, this is a blessing and a curse, depending on its style and its location. It does remind you that Berlin is an artistic hot bed where despite the sterotype of Germanic conformity, bursts of creativity are evident. The only way to understand this city is to understand its history, from preserved Prussian facades carefully covered in glass to communist style tower blocks that are still revered by many an elder, Berlin has all the hallmarks of a city thats lived through the good and the bad. Over 75% of the buildings were destroyed during the Allied bombings of WWII but of that nearly 80% of the rubble was reused to raise this city like a phoenix from the ashes. Anything that was left over was piled high and can still be seen today but in a different guise as the cities only notable hills. 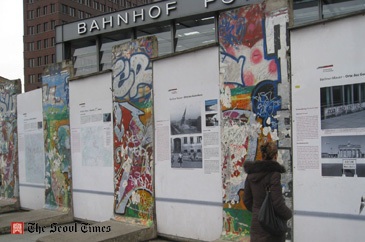 Next year is the 20th anniversary of the fall of the Berlin wall and is gearing up to host a number of events to attract tourists to celebrate the reunification of Germany. Berlin is well serviced with three airports all of which will be supersecded by the new purpose built Berlin-Brandenburg airport set to open in 2011 on the ground of airport Schšnefeld. Transport links are good with both buses and trains easily available to the visitor. Berlin is serviced by a metro and an overground rail line along with a bus and tram system which run from the airport, connections to some other German cities are available from here as well or you can take the train into the central station Berlin Hauptbahnhof where you'll find yourself at the largest crossing station in Europe. Taxis are easily recognised as they are all cream coloured Mercedes Benz with fares been reasonable. A taxi from Schoenfeld is 30-35 euro into the city centre and is metered. Or you can take the S-Bahn (suburban train) lines S49 and S9 into Friedrichstra§e station and then either change trains to your destination or get out and get a taxi direct to your hotel. Tickets for these trains or the S-Bahn cost Ű 2.10. S45 and S9 need about 45 minutes for the trip to the centre. Remember in Berlin the ÔhonestyŐ system operates, there are no gates to get through, you simply buy your ticket and validate it on the platform in the little red poles. Simply insert your ticket there and it will put a time and date on it. I would recommend a Berlin Welcome Card which is a general travel card that will give you access to all of Berlins transport over either a 48 or 72 hour period and will cut out all the hassle of constantly buying new tickets for each trip and will save you money as well. You can buy this at the tourist information stand at the airport and will cost from Ű 16.50 to Ű 21.50 per person. 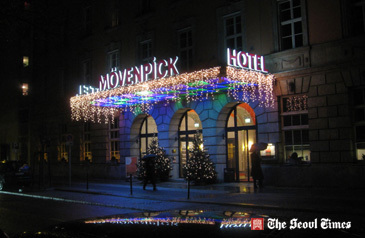 Mšvenpick Hotel Berlin Schšneberger Strasse 3, 10963 Berlin, Phone +49 30 23006 194 www.moevenpick-berlin.com near Potsdamer Platz in the heart of Berlin is an ideal base for your travels around the city. Recently renoveated in a historically listed building of the old Siemens plant. The hotel is a daring mix of the old and new. The service is excellent and they provide a great value buffet dinner for only Ű 22. The breakfast is excellent and there are gym and sauna facilities for those who wish to avail. The room was fresh and modern with high ceilings and great furniture. The glass blocks used for the bathroom area wouldn't afford you the privacy as normally expected, so be warned, they won't be to everyones taste. Berlin has so much to offer, depending on your season of travel, events and activities vary. 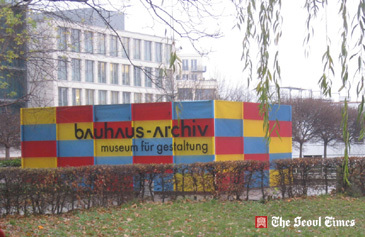 From Museums to bars and playgrounds Berlin has a wealth of things to do and see. Check out www.visitberlin.de for an overview. I'd recommend a city tour first of all so you can get a good overview of what's to see. These are available by bus, boat, plane or bike. The yellow buses of the Daily City Circle sightseeing tours have double-decker buses (open roof in summer) with guides in 8 languages starting every 15/30 minutes. Starting points: Kudamm and Alexanderplatz. www.sightseeing.de Tours by bicycle, or on boats down the river run until October each year and can be a great way to see the city from a different angle. Berlin clubs are allowed to open all the time and alcohol is widely available. For however long you want to stay out, Berlin will too. Most of the best pubs/bars and clubs don't go in for heavy advertising which can be a blessing as when you do get there they won't be packed but for the Tourist a good place to start would be the Mitte district which boasts top venues such as King Kong Klub, Kaffee Burger, Zapata and White Trash Fast Food. Check out the links for more information and directions. A major theme for the year 2009 will therefore be "20 Years since the Fall of the Wall." Exhibitions such as "Perspectives - 20 Years of a Changing Berlin" will give you a overview of how the city has changed in the last 20 years. Additionally at a grand festive event on November 9, a symbolic wall will be brought down once again. Check out the East Side Gallery to give you an idea of what the Berlin Wall looked like, with sections still preserved, it is now the largest open air gallery in the world and was opened on September 28, 1990. It stretches from Ostbahnhof station to the Oberbaumbrźcke. 118 artists from 21 countries have painted several pictures on a 1,316 meter long section of the Berlin Wall, which is now a listed landmark. Bringing children to a major metropolis has can be a joy or a nightmare. To make sure it doesn';t turn into the later, take some time and plan out what your going to do. Berlin offers special kids-programs in theatres, cinemas and museums and a ramble through the city can be a very special experience for both - young and old. Below is a list of possible days out. A walkabout will lead you to Kollwitzplatz in the district Prenzlauer Berg. Here you can rediscover the Berlin of 1900 and the kids can romp on a big playground. Or you can take a stroll through Hackesche Hšfe in the Mitte district and afterwards you can splash in the Kinderbad baths at Monbijouplatz. Visit the world famous zoo and take a leisurely stroll on Kurfźrstendamm with some of Berlins best shops. Berlin also has some ÔwowŐ factor experiences for kids and adults alike and I'd recommend any of the following AquaDom & Sea Life Berlin - Experience the fascinating local underwater world and afterwards the AquaDom - the biggest detached aquarium in the world. Spandauer Stra§e 3, Berlin-Mitte Check out www.sealifeeurope.com for more. 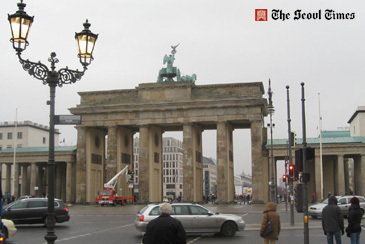 The Brandenburg Gate is a former city gate and one of the main symbols of Berlin and Germany. The Gastro-Rallye which is a personal culinary tour of quirky urban eateries while at the same time having an in depth lesson into the history and culture behind it. This tour solves the eternal problem that everyone has when you land in an unknown place, where's the best place to eat/go/do? The food is fantastic but really only an alibi for what is really an unforgettable experience of what its' like to go out in Berlin as a local. These experiences only happen when you have a good friend living somewhere and they bring you to their favourite bar or restaurant and show you what's good to eat or do. You wouldn't be able to find most of theses places no matter how many lonely planet books you read. Tours cater for groups from 2 to 15 people, can be catered to fit your needs and last for 4 hours taking in 4 restaurants with a course or two along with a drink in each included. Costs vary depending on the type of tour but for example for a group of 6-9 it would cost Ű 99 each for standard Gastro Tour. Check out the website for details on other tours including the Urban Living Tour where you go to a dinner party hosted by normal every day Berliners and get a first hand authentic insight into what their world is like. Visit www.gastro-rallye.com and learn more. Berlin has so much to offer as both a short and medium term destination. As Germanys capital reintegrates its east and west elements together it creates a living city thats vibrant and edgy with an old style charm and because of the history it's changing rapidly making this a fascinating city to visit. Flights from Seoul to Berlin with Lufthansa are available for in and around Ű 800 / $1000 round trip. Check out British Airways and Cathy Pacific as well and compare prices for your time of travel.